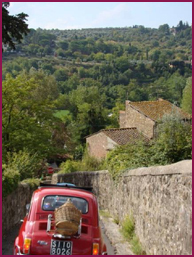 Experience Tuscany in a unique way…tour by Fiat 500! Your Friend In Italy is happy to propose this exciting Fiat 500 tour to our clients as a unique way to experience Tuscany! There are daily departures and a choice of tour routes and itineraries. For the independent explorer, the Fiat 500s are also available for private hire and are perfect for special occasions that demand prestige, nostalgia and originality. The Fiat 500’s can be rented for weddings, events or photo shoots. Why a Fiat 500? The Fiat 500 (the “cinquecento” is the Italian word for “500”) is a car produced by the Fiat company of Italy between 1957 and 1975 to meet the demands of the post-war market, which called for economy cars. Today, the Fiat 500 it is a classic Italian icon! You choose your classic 1950’s or 60’s Fiat from our fleet of 6 immaculately restored “cinquecento”, all named after local Italian Friends of the company that have helped the business on its road to fruition, and strangely enough each reflecting their unique characters. Your guide and expert then takes you through the nuances of vintage car clutch control. You must be able to drive a manual car. Having mastered “la doppietta” (a much more lyrical way of expressing “double de-clutch) the convoy rolls out and your unforgettable Fiat 500 tour begins! 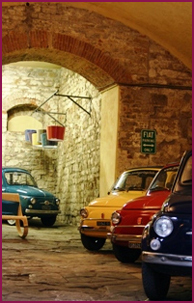 The Fiat 500 tour will begin with an introduction to the cars and starts on a private road through vineyards and olive groves on the grounds of a 15th century villa. You will meander through walled country roads, with panoramas resplendent with monasteries, olive groves and grapevines, as your guide entertains you with history and local knowledge of the Tuscan area. The Fiat 500 tour includes a stop to lookout over Florence, views over Tuscany, tour commentary from an experienced guide and a drive through a small section of Florence itself. After that you simply follow the guide, who from the lead car, (via 2 way radio) will inform and entertain you with not just the Renaissance history for which the city is famous, but also some more current anecdotes. You’re driving an Italian icon, known and loved by all Italians and owned at one time by the majority of them as a true “car of the people”. Be aware that you’re virtually guaranteed to become part of hundreds of other peoples’ holidays, as the Fiat 500 convoy attracts lots of smiles, waves, cameras and videos as it trundles by! There are carefully selected stops on each Fiat 500 tour so that you can enjoy views of the city and the surrounding countryside. There are some great panoramic photo stops on this tour. There is a delightful selection of Fiat 500 tours to choose from. Fiat 500 tour prices and more info available upon request. Click here to discover more Florence and Tuscany Tours!